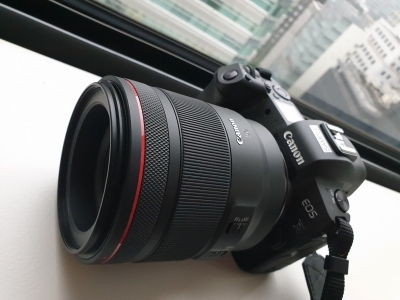 Tokyo Sep 14 (IANS) Sending a strong message to the existing players in the mirrorless camera segment Japanese major Canon which just unveiled its first full-frame mirrorless camera EOS R is ready to roll out more enhanced devices in the near future. For the $11 billion camera industry mirrorless cameras have been a growth engine as digital/compact camera shipments have plummeted. Currently Sony and Nikon are the leading players in the professional-grade camera segment. According to Japan-based industry body Camera Imaging Products Association (CIPA) mirrorless cameras account for about a third of the segment s revenue today -- up from 9 per cent in 2012. "We brought the EOS series to the world 30 years ago. With the EOS R we are confident that you will have an amazing experience. We will improve further and deliver enhanced devices in the EOS segment " said Naoya Kaneda Advisory Director Group Executive ICB Optical Business Group Image Communication Business Operations Canon. The EOS R which will be launched in India on September 21 and the price for the country is yet to be announced employs the newly-developed RF Mount. The EOS R is slated to ship in October globally with a price tag of nearly $2 300 (for the body) and $3 400 for the kit (with RF 24-105mm f4L IS lens). In April Canon India launched "EOS M50" -- a new mirrorless camera for the millennials in India that houses the "DIGIC 8" image processor to ensure better picture quality and comes with 4K movie shooting capability. "This is just the beginning. We will further improve our ecosystem - lens processor and sensor -- after listening from our customers and innovation teams. For us feedback from our customers is of great importance " Kaneda told a visiting group of journalists here. With removing the mirror system in the EOS R the company has reduced the distance between the lens and the image sensor which leads to high speed ease of use and better image quality. "Canon is moving to the next stage. We are pushing the boundaries of imaging expression " Canon President Masaya Maeda said during the first unveiling of EOS R here on September 5. The Canon EOS R -- along with four RF lenses and four types of mount adapters -- has a 30.3MP Full-frame CMOS sensor and an ISO range of 100 to 40 000 (expandable up to 50-102 400). "The aim is now to take the EOS series is to a new level and create a new ecosystem while acquiring new digital natives in our journey to create new business models " noted Go Tokura Executive Officer and Chief Executive Image Communication Business Operations at Canon.